All-inclusive resorts are such an amazingly convenient and cost-effective way of traveling to our favorite tropical destinations. It takes a lot of heavy planning out of traveling, with nearly everything being included in your stay – meals, drinks, room service, and even some activities. With the “everything-is-covered” model, it prompts a lot of our clients to ask: “Are tips already in the price?” This is a tricky one to answer with a solid “yes” or “no.” The short answer is gratuity is not obligatory, so it is not necessarily included. However you may still feel the need to tip the people giving you incredible service. To try and answer this question once and for all, we have put together our guide for tipping in destination. If you have ever searched a resort’s website for gratuity information, you probably came up a little short. Resort brands do not typically advertise their expectations in regards to gratuity, but generally they do not require you to tip. We should say that the views about tipping we present here are not to represent the views of our resort partners. The idea of an all-inclusive resort is for you to not worry about everyday inconveniences like costs and bills, so they do not necessarily want you to worry about tipping either. However if you have ever been to an all-inclusive resort, you will have noticed something. Most guests still tip. It’s one of those forces of habit that’s hard to shake. When we receive great service, we want to show our appreciation with a tip. For many, it’s just the polite thing to do. 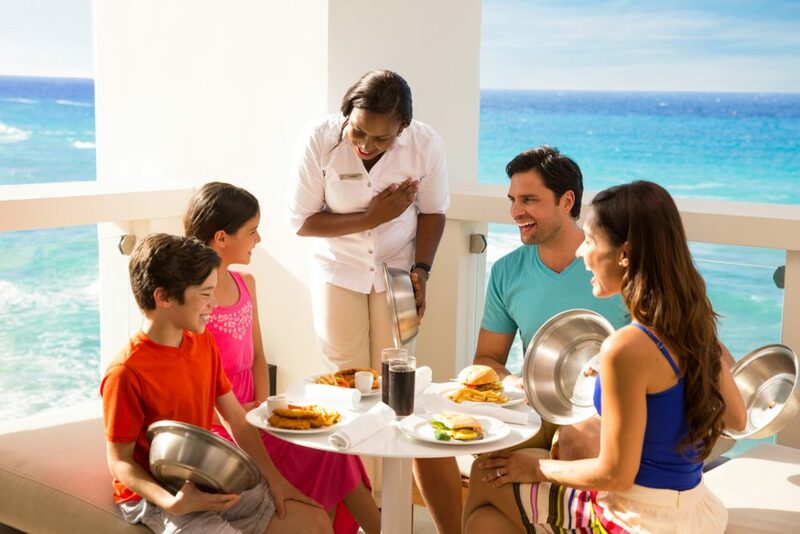 So while it is not expected and you do not have to, you will notice that tipping is normal at all-inclusive resorts. So now you may be asking, “If I am tipping, how much should I leave?” Well, this is partly to your discretion, but the 20% rule generally doesn’t apply here. For one, you are not paying a bill, so there is no way you will know how much your meal was anyway. Also 20% is quite a bit higher than the norm for all-inclusive’s. Remember you are eating at a restaurant or receiving room service for every meal. If you were tipping $10 -$20 per meal, it would add up quick! If you have the means and want to make the staff’s day, then feel free! However most will find that $1 -$5 per meal is a good general rule (per person). Pro tip though: set down a $10 bill at the bar, and you’ll never have an empty glass. Image provided by Panama Jack Resorts. If you plan on calculating how much cash you will need for tips, keep in mind the types of service you will receive while in travel. You have the $1 -$5 meal and drinks guideline, but what do you tip your maid? Again this is a generic number and you can adjust as you see fit, but $2 -$3/day for maid service is the average. A bellhop or room service tip is about $1 -$2 as well. 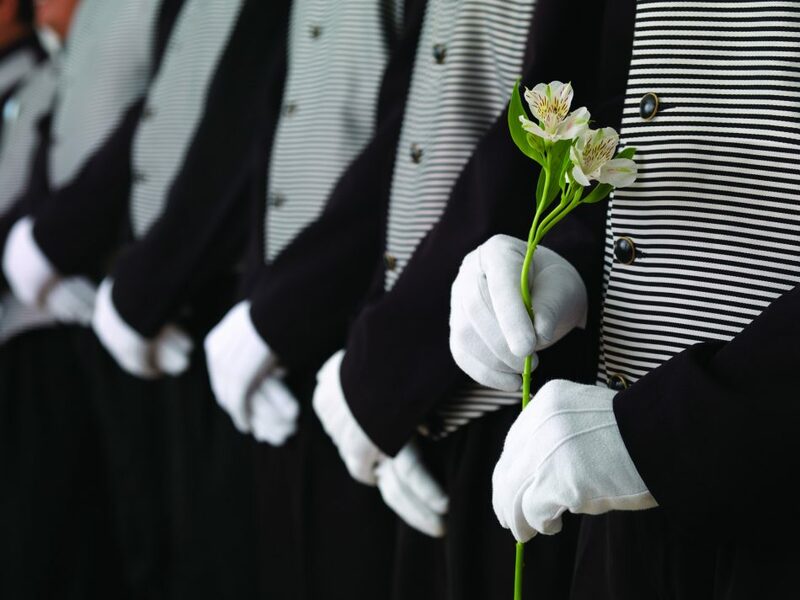 There are other levels of service you might be receiving during your stay, such as a personal concierge or butler. For this elevated service, you might expect to tip more around $5 – $20 each day (or about 5% the room rate per night), depending on the amount of attention you are receiving. It is customary to tip your butler when he/she brings the luggage to your room as you would tip a bellhop and then the full amount at the end of your stay. Bring an envelope along with you if you are tipping a butler or concierge. It adds a touch of class and you will be able to write their name on it if they are not available at the time you check-out. 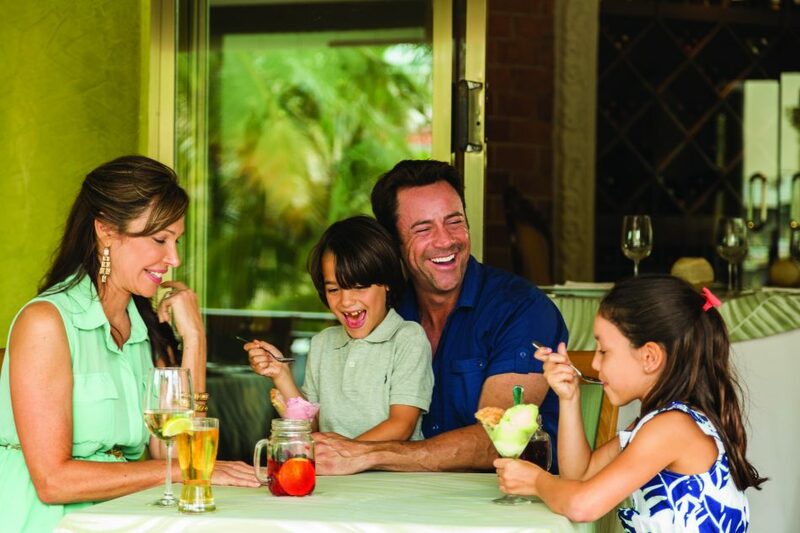 Image provided by Palace Resorts. The vast majority of resorts accept U.S. dollars, so you don’t need to rush out to a bank to have your currency exchanged. This applies to a lot of tour companies in destination as well. If you are from outside of the U.S., your currency might be accepted as well, but make sure to check with the resort ahead of time. Services that are not mainly used by tourists, like taxis or offsite restaurants, might not accept other currency, however. So make sure to do your research ahead of time if you plan to use these. It might surprise you that a lot of resorts pull all tips for wait staff to be divvied out equally at the end of the week. This is not to say that your favorite bartender isn’t getting the good tip they deserve. The more you tip across the board, the more your amazing wait staff sees the benefits! 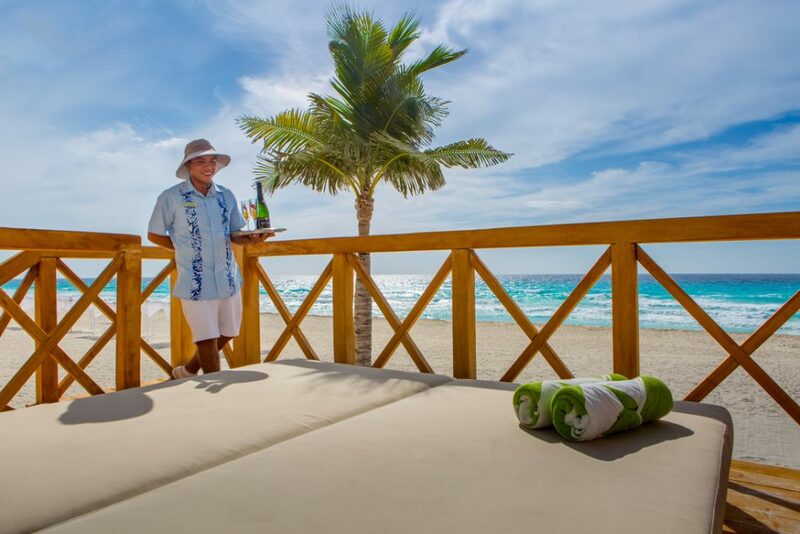 Image provided by Playa Resorts. Often there are other people taking part in making sure you have a great time on your trip. You can plan on tipping your driver to and from the resort $3- $5 each way. Are you going to take a tour? Allocate between $5 – $20 for a tip. Twenty dollars sounds like a lot, but some tours are 11 hours+ and could have a few guides involved. Use your best judgement on what is appropriate for the excursion. Always add in a little extra to the cash you bring along for miscellaneous things. For example, the Cancun/Riviera Maya eco tax is a little over $1 per day and collected when you check out and the Dominican Republic requires $10 for purchase of a tourist card when you arrive (although this can be pre-purchased online). If you are taking a salt water excursion in Riviera Maya, you will need to pay a $2 environment tax. These rates are subject to change in the future. Quick story time. I recently traveled to a resort that has golf carts driven by employees to get you around the large complex. I saw someone tip the golf cart driver near the beginning of my stay, so I of course started tipping them $2 per ride. Here’s the thing, though: I needed to use the golf carts a lot. My golf cart tip budget very quickly ate away at my cash funds. That’s not to say I didn’t think the drivers deserved it, but you don’t have to go crazy. A $2 tip for a one minute ride is not really necessary unless you have cash to burn. Feel comfortable measuring up the level of service to the amount of gratuity you think you should give. As mentioned, it is not necessarily expected that you give gratuity at all-inclusive resorts, so don’t think any of the staff are going to make you feel bad about it. They are, on the whole, abundantly kind and appreciative when receiving tips. They do all they can to ensure you have a care-free, relaxed time, so even a small token of appreciation goes a long way!